When I came up with the idea for #bloglikecrazy several months ago I had an ulterior motive. While I, of course, wanted the challenge to get other women motivated to write and blog regularly, I also hoped the project would increase traffic to my blog. And I did see a small boost in traffic, but by the second week of the challenge I didn't care about my stats. Something much more important and more exciting was happening. Thanks to the number of See Jane Write members participating, women bloggers in the Birmingham area started using #bloglikecrazy to build community. The ladies shared their posts on the See Jane Write Facebook group page and in the process discovered a host of common interests. One thing we quickly learned was that several of us were fitness fanatics. So Tanya Sylvan had the great idea of organizing See Jane Move. 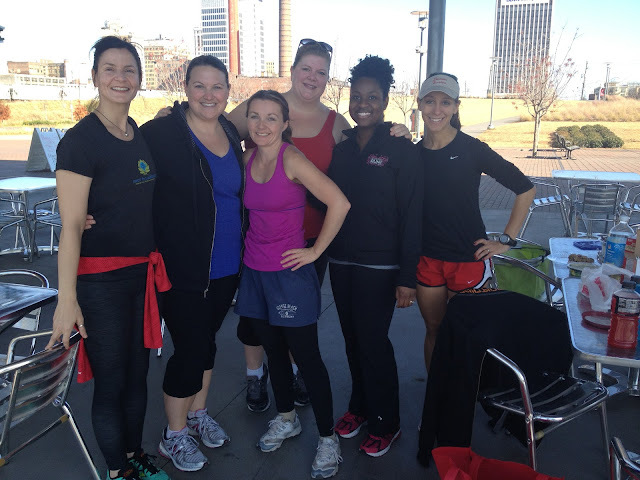 Yesterday morning I started my day with a gathering of a few of my favorite women who write at Railroad Park. The weather was absolutely perfect as we did laps around the park for about an hour and then sat down for a potluck brunch. We noshed on fruit, confetti rice and bean salad, and other healthy snacks and talked about nearly everything from personal branding to blog design to DIY manicures. And as I sat there I saw a blogging lesson come to life: it's all about people, not pageviews. No amount of web hits could have created the joy I felt this morning. I left the park feeling so inspired by the girl power in the air and very hopeful about the future of See Jane Write. See Jane Move was an excellent way to start a Saturday and a perfect way to end #bloglikecrazy. I wish more people had this mentality. Personally, I blog because it's what I enjoy and I like connecting with different people. Like you, I really don't care about the amount of comments that are left and the amount of page views I receive. I've met and connected with some amazing people and I love it! Actually, Carla, I have been thinking about See Jane Write t-shirts or tote bags!